Latest statistics from the UK Health and Safety Executive show that almost of half of fatal injuries in the construction industry involve falls from height. Almost 18% of reportable injuries involve falls from height. This is the reason why I think it worth devoting a whole page to the subject of shed roof safety. Working on a shed roof presents different hazards to working on a house roof or a large warehouse roof. The height isn't as large and the roof area is smaller too however the risk is still there and with a little forethought and planning the work can be undertaken safely and easily. The key to a safe project is think through the whole project before you start. Decisions that you make before you start construction can minimise risks to you once you begin to construct your shed roof. I have made a list of six points to help you with planning for shed roof safety and keep you safe during your roof build. The first three items are things to think about well before you even start on site. Do power or other cables that pass over the site? A ladder, timber or even you could touch or snag one of these with predictable results. What is the condition of the ground around the shed? If the ground is soft this may mean that you need spreaders to support the feet of the ladder. Is the ground is sloping? If so you may need to cut into the ground to make localised level places for the feet of the ladder to sit on. It is unlikely that you will need an access scaffold around the perimeter of the roof. But for larger projects, it might be something for you to consider. 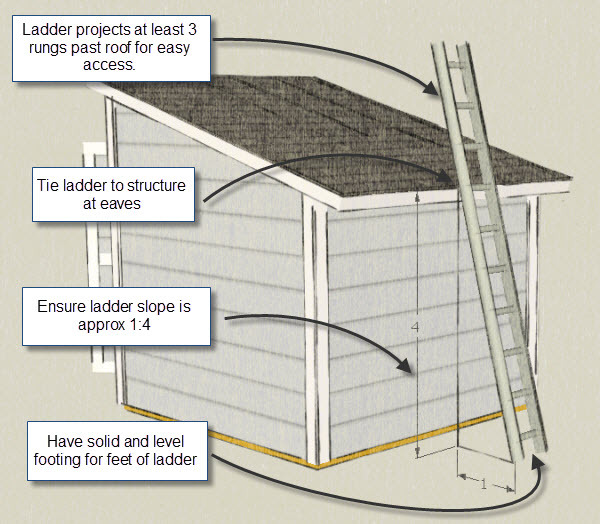 It is likely that most roof access for shed builders will be using some form of ladder, rather than a scaffold or access tower. What sort of ladder are you going to use? Is it going to be easy to move the ladder as you work on different areas of the shed? The image below should give you some idea of the options between a ladder, step ladder and access platform. Different access solutions work better at different stages of the project and for different sizes and shapes of shed. If you are using a regular ladder. Is it the right length? How are you going to fix the foot and tie the head? How many ladders do you need? If there are two of you lifting trusses on to the roof, will you need two ladders? If you need to get tools or supplies onto the rooftop, consider how you will get them up and down safely. Be prepared to ask someone to assist you. Before you start it is worth objectively assessing your own health. If it is a while since you did manual work of this type then do a quick review of your suitability for heavy manual work. It really is worth asking your partner for their comment. There may be something that you hadn’t thought of that means you need help with the project at certain stages. Always consider getting extra help if you need it. This could be another family member, friend or even paying a professional tradesman or labourer to help for a day or two. Employing a skilled tradesman might be a great help for parts of the project that are out of your comfort zone. A key part of your shed roof safety plan is to consider what happens in the case of an emergency. Do you need someone working with you, or within earshot, to ask for help if required? If you are working alone make sure that someone regularly checks on you. There are cases of people who have been injured whilst working alone and have been unable to call for help. In extreme cases, people have lain injured overnight. Until reported missing by concerned relatives. It is also worth keeping a cell phone easily accessible in your tool belt. The next three points relate to things to assess each time you start work. Things that we do every day at ground level are more difficult when working on a ladder or on a roof and the consequences can be much more serious. Working on a roof, even a small shed roof, you are exposed to the sun, the wind and the rain. These all have an effect on shed roof safety. If it is windy or rainy, consider putting off the work until the weather improves. Working at height, with wet ladder steps and on slick surfaces invites unnecessary danger. Even after the rain stops, avoid working on roofing projects. After the rain the ground may be muddy or saturated, and wet ground conditions can lead to the ladder slipping or sinking. When the sun starts to shine and the roof is dry, it still may not be plain sailing. Working on an exposed roof in the hot sun means that you need to consider using sunscreen and a hat. This moves us conveniently on to Personal Protective Equipment (PPE). 5. What PPE is required? However, this is your project and it is down to you to decide what is right for you, and anyone else, on your site. Hi-visibility workwear is frequently used to increase visibility when working with heavy machinery or as part of a team. If you are working alone it may not be required. The same goes for a formal Hardhat, though a bump cap may be useful to prevent scraping your head on rafters and other newly constructed areas. A protective sole to protect against stray nails projecting from scraps of wood. Eye protection is essential, particularly when using power tools. Work gloves to protect against splinters, cuts and minor injuries. If the work you are doing is going to be dusty or create fumes then make sure the area is well ventilated and you wear a suitable mask. Whew.....it is nearly the last point and we have barely got up on to the roof yet! Take frequent breaks. Avoid spending long periods of time on the ladder. You can get stiff or tired and the risk of falling or injuring yourself will increase. Be careful that anything placed on the roof cannot fall off and hurt someone below. If there is no way to completely and safely secure material on the roof, this should only be for a short period of time. And make sure that the ground area below is cordoned off. To prevent anyone walking into the risk area. Get down off of the roof or ladder before you engage in activities that will divert your attention. Do not talk on your cell phone, eat, drink, or chat unnecessarily while you are on the rooftop or ladder. When working on a ladder, try to achieve three points of contact whenever possible. I really do hope that you made it through all those points. The key to the whole shed roof safety issue is through planning before hand. By identifying hazardous procedures you can work out ways to make the work safer or even to omit them altogether. Keeping in mind the above six points will help you to avoid making your shed construction project memorable for the wrong reasons. The number and type of accidents that can occur on a building site are almost infinite though the main headings and risk factors are fairly predictable. Good luck with predicting the unpredictable and stay safe out there!